Home > BERSERK > Sold Out Items > No. 240 Beherit: Egg of the King- 2011 Version *Sold out! No. 240 Beherit: Egg of the King- 2011 Version *Sold out! For this "Beherit: Egg of the King", we chose to use a quality black leather strap to show the subtle gradations of color. *Please note: The difference between this item and the Exclusive Version's "Egg of the King"is the leather strap (without clasp). Beherit 2011 Version is more vivid than our previous Beherit and it has a moderate luster. This "Egg of the King" is just like a quiet living creature. We used crimson and other various colors to give it delicate effects. 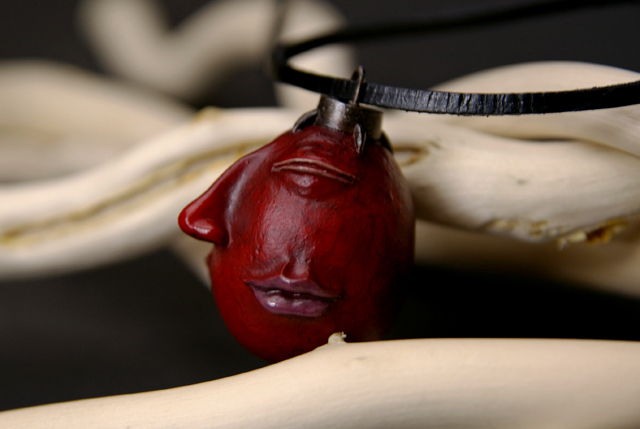 For instance, the "Egg of the King" is like in a state of sleep, so we painted it in a dark red. You can enjoy the subtle gradations of color. You will also be surprised at how this Beherit 2011 Version is being made in great detail. For instance, the vessel-like paint application on the surface was painted by hand. The fantastic finishing was all done by our skilled workers. And we added oxidized paint effect on the metal fitting part. Moreover, the color of Beherit's eyes and lips greatly brought out the Beherit's complexion. Compared to "Shoku"'s realistic facial expression, we hope you enjoy the quietness of "Egg of the King".